Very fine to very fine+, Very scarce. 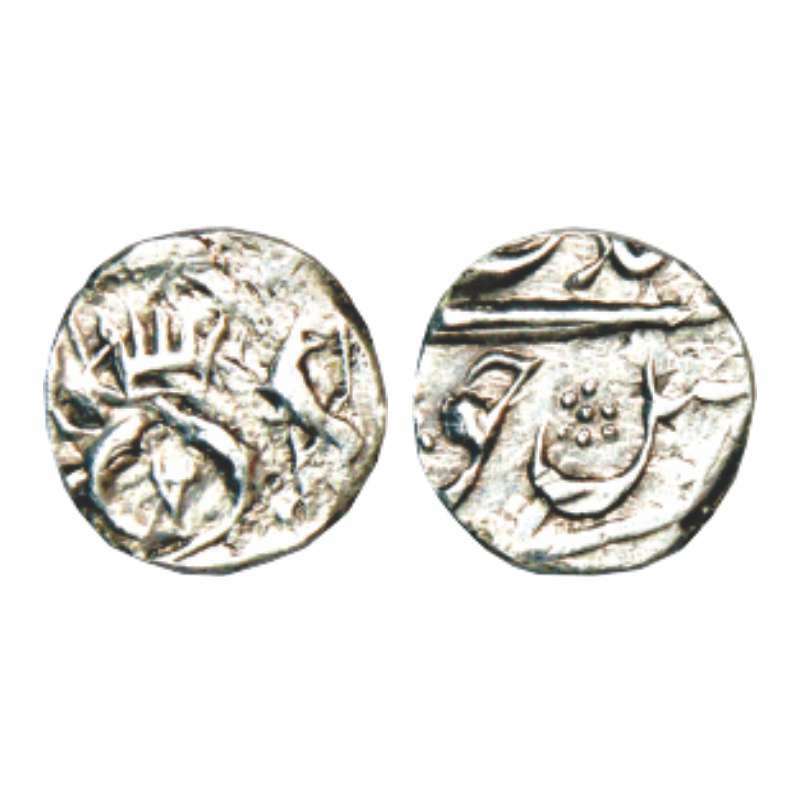 Alwar, Mangal Singh (1874-1892 AD), silver rupee, AD 1891. 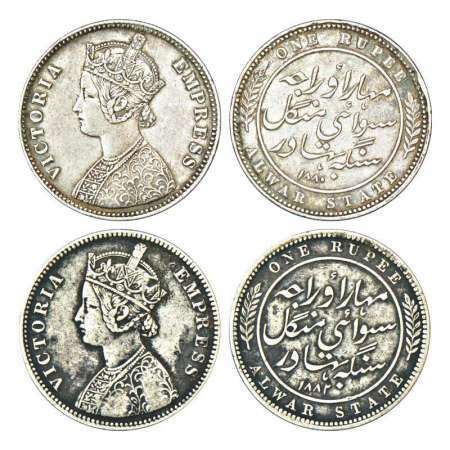 Obv: Portrait bust of Victoria Empress. 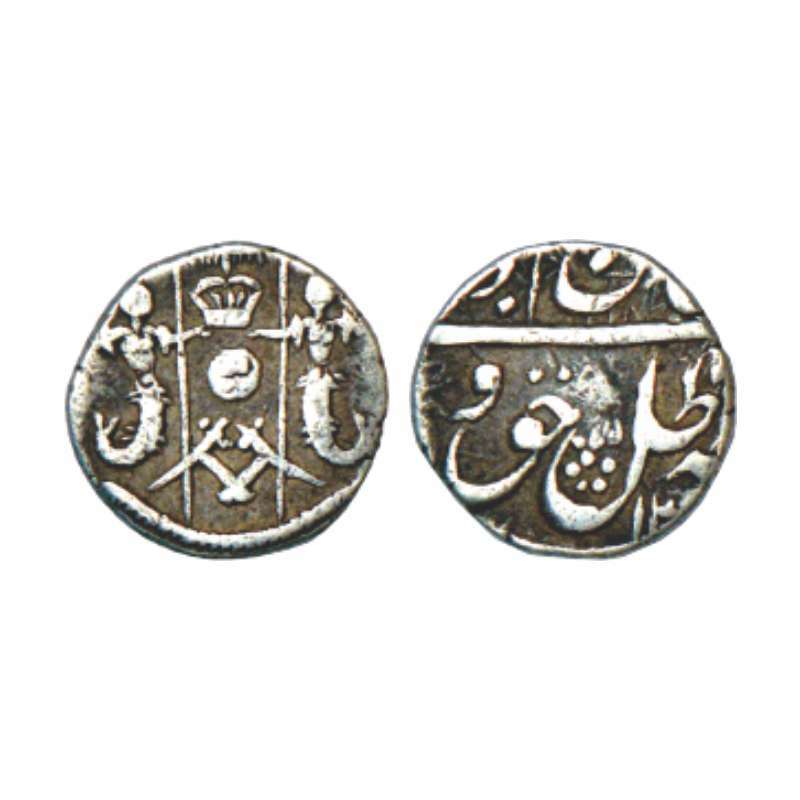 Rev: Persian legend Maharaja Dhiraj Sawai Mangal Singh Bahadur, KM 46. 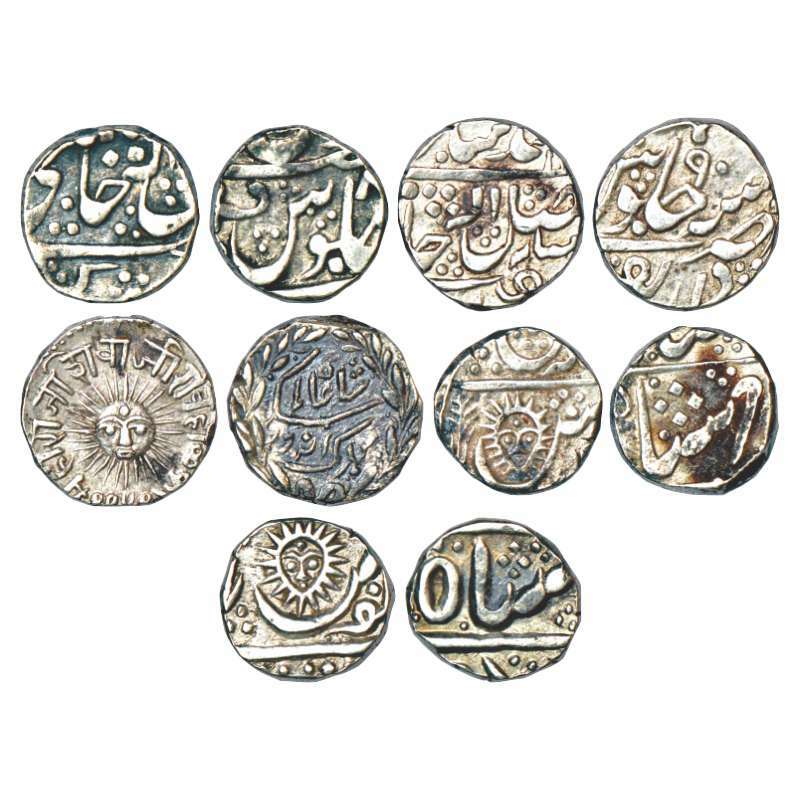 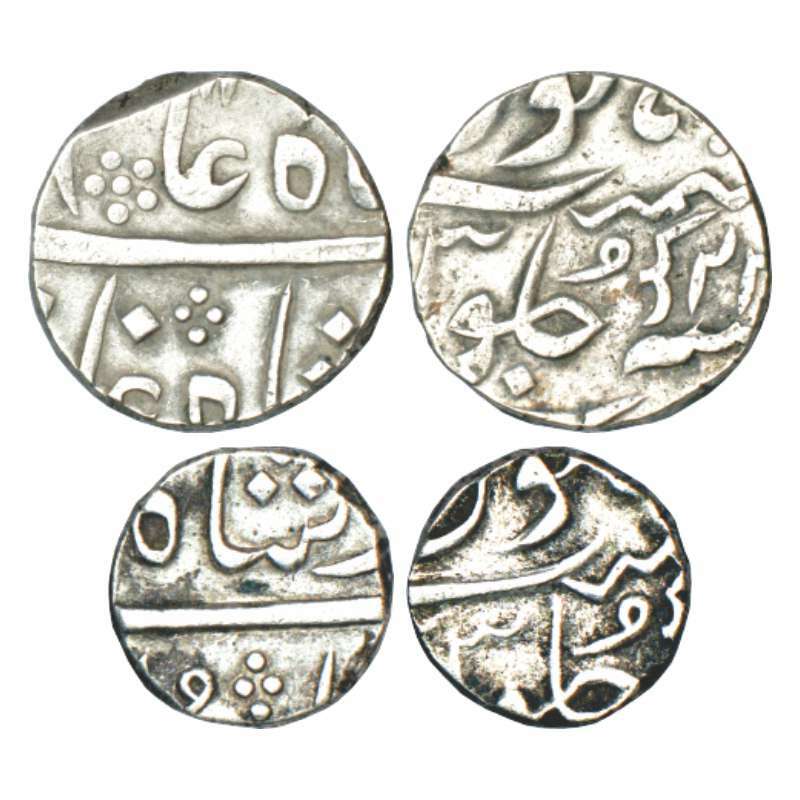 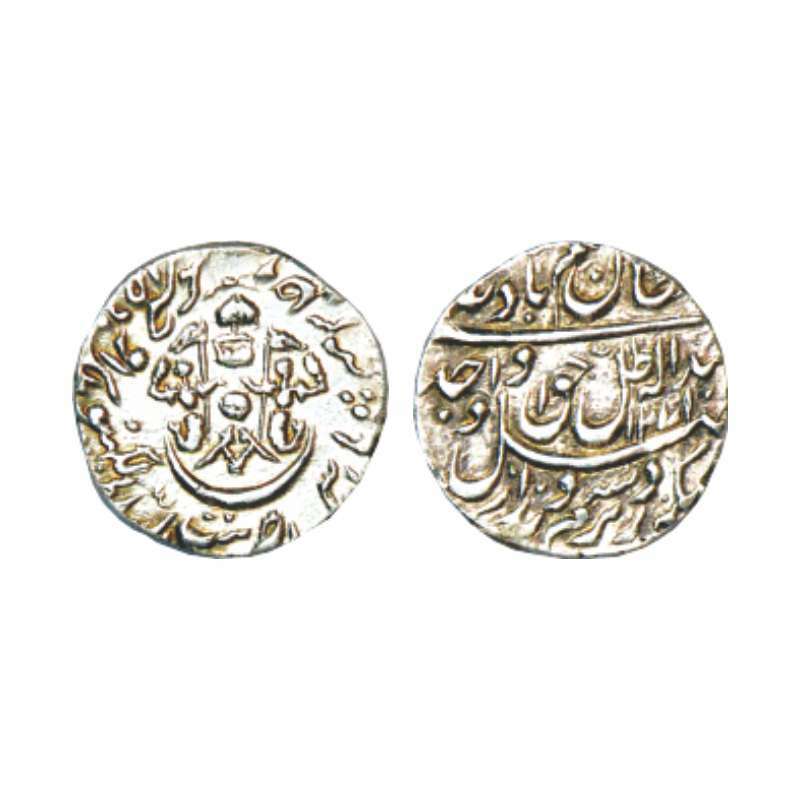 Awadh, Shuja ud-Daula (1754-1775AD), silver rupee in the name of Alamgir II, Shahabad Qanauj mint AH1167/RY Ahd, KM 85, 10.77g. 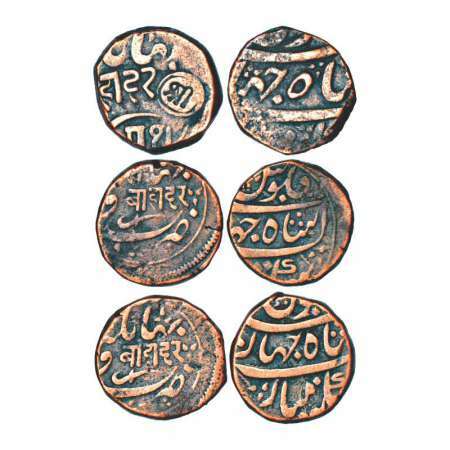 About very fine, Very rare. The coin has 'Aziz al-Daula' as the laqab of Alamgir II which is found only on the issues of RY Ahd of Qanauj and Farrukhabad mints. 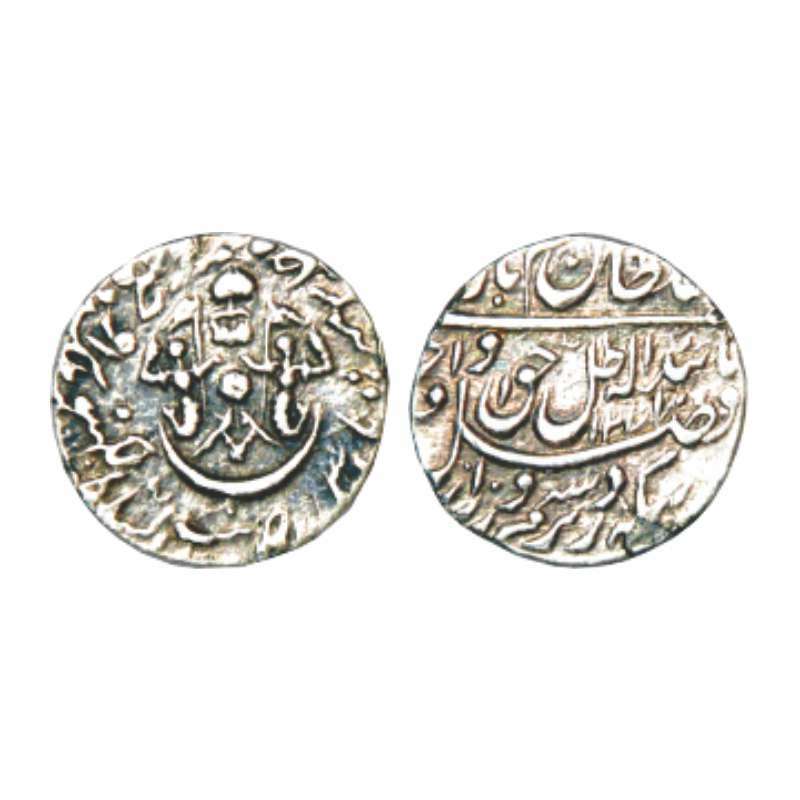 His laqab was actually 'Aziz al-Din'. 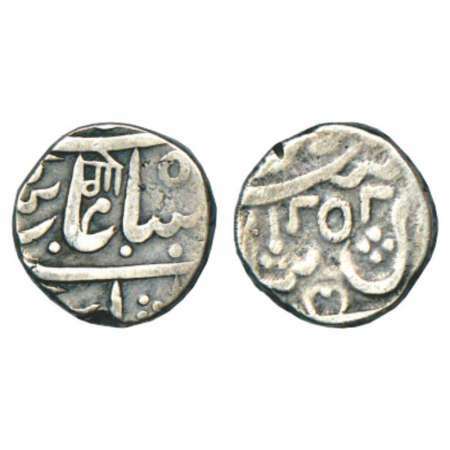 Issued under the authority of Bangash Nawabs of Farrukhabad. 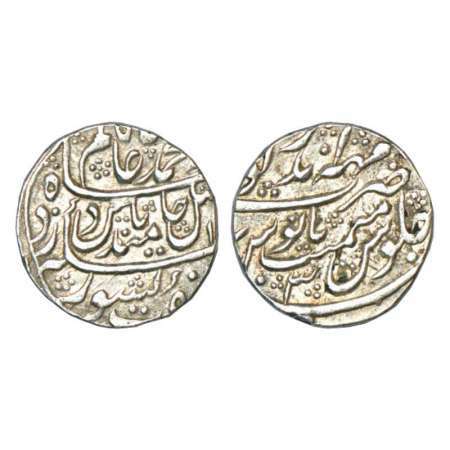 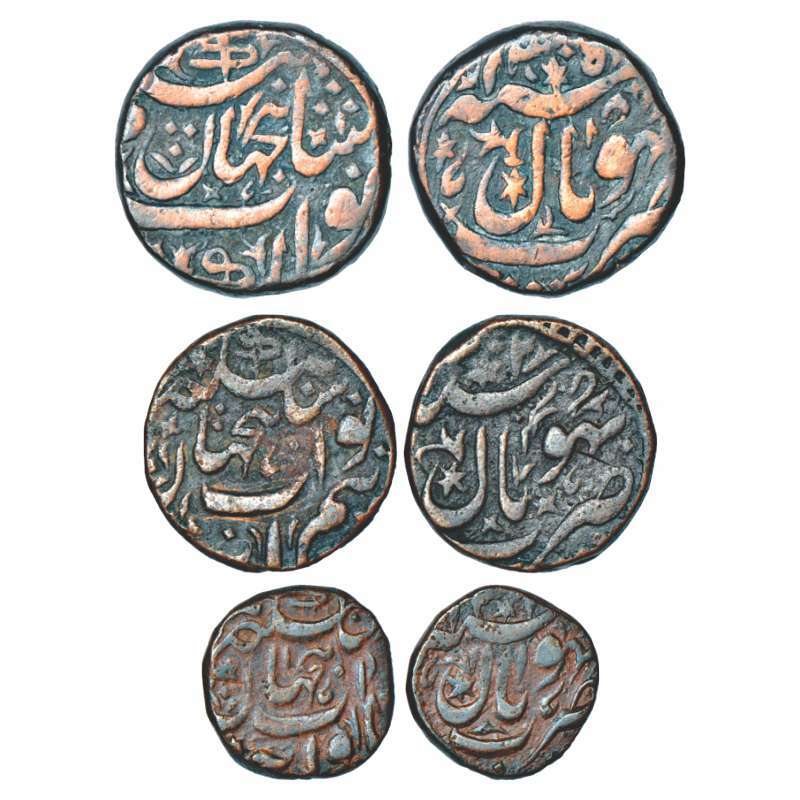 Awadh, Amjad Ali Shah (1842-1847 AD), silver 1/8 rupee, 1.38g, Lakhnau mint, KM 328. 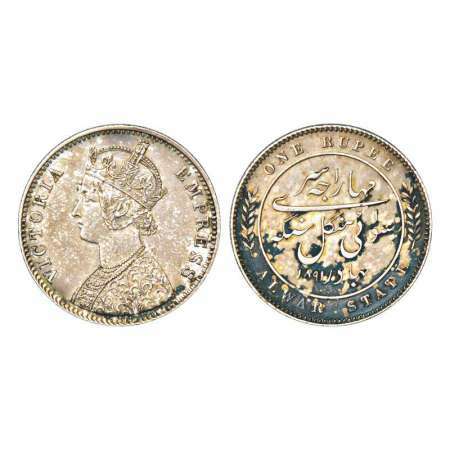 Ex-mount, About very fine, Very scarce. 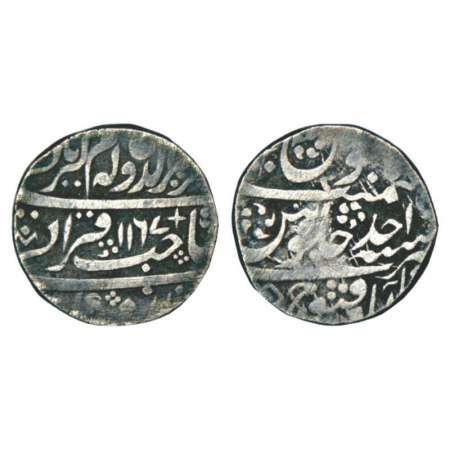 Awadh, Wajid Ali Shah (1847-1856 AD), silver 1/8 rupee, 1.36g, Lakhnau mint, AH 1269/RY 6, KM 357.2. 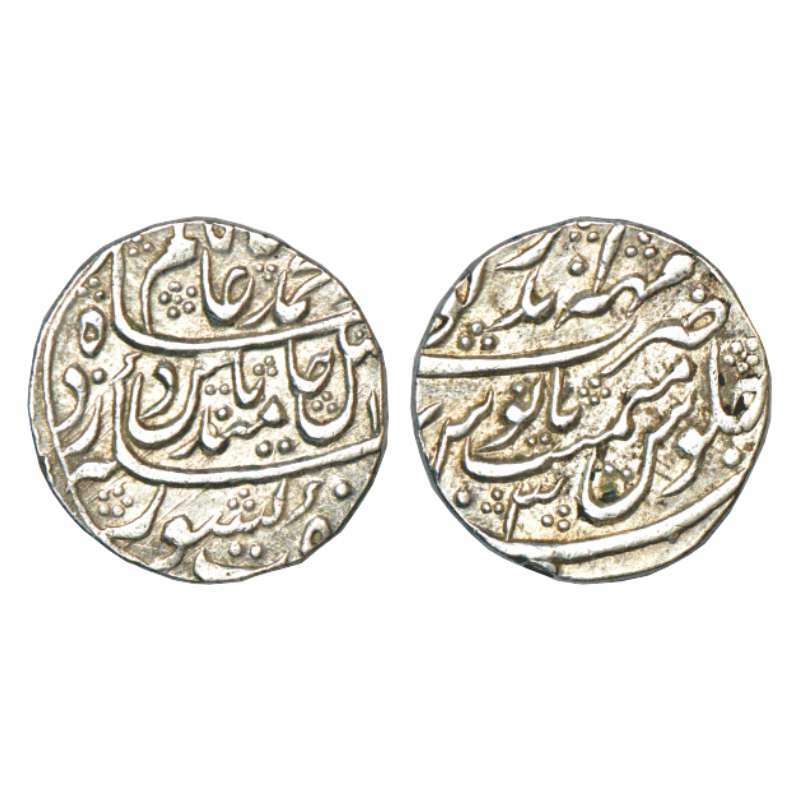 Awadh, Wajid Ali Shah (1847-1856 AD), silver 1/8 rupee, 1.38g, Lakhnau mint, AH 1271, KM 357.2. Awadh, Wajid Ali Shah (1847-1856 AD), silver 1/8 rupee, 1.38g, Lakhnau mint, AH 1271/RY 9, KM 357.2. 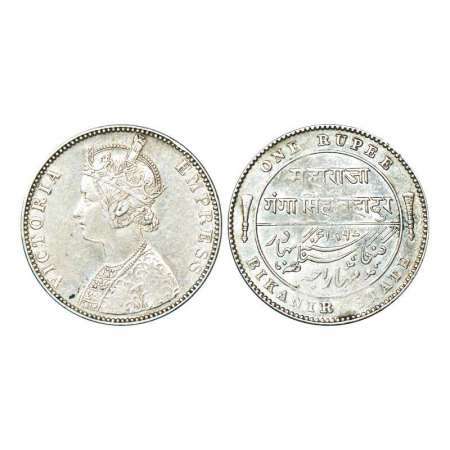 Awadh, Wajid Ali Shah (1847-1856AD), silver 1/8 rupee, 1.35g, Lakhnau mint, AH 12xx, KM 357.2. Awadh, Wajid Ali Shah (1847-1856 AD), silver 1/8 rupee, 1.36g, Lakhnau mint, KM 357.2. 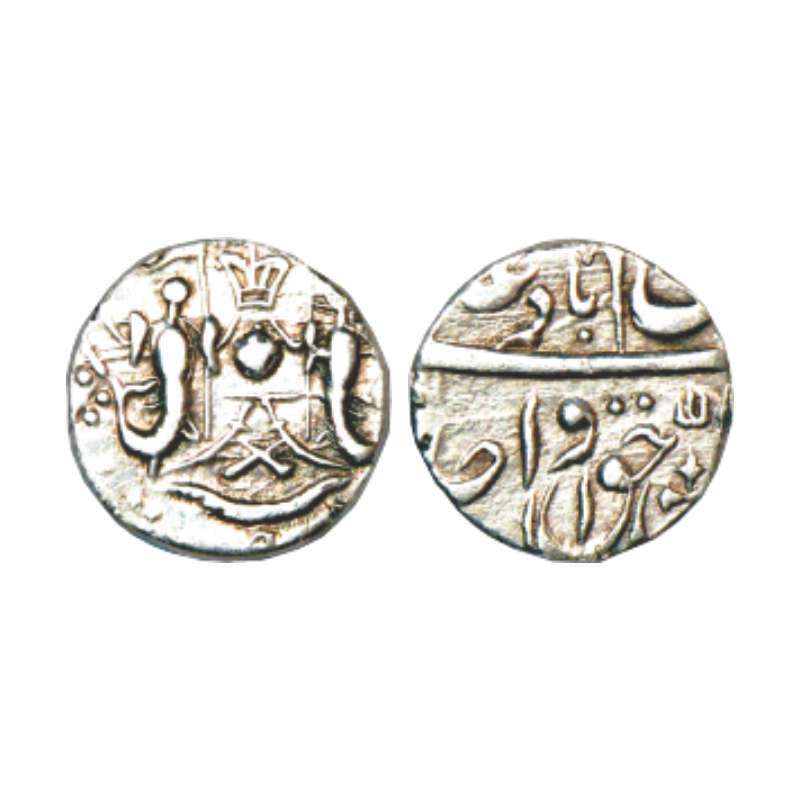 Baroda, Khande Rao (1856-1870 AD), silver rupee, AH 127x, 11.16g obverse brockage (Lakhi), shows retrograde impression of obverse on reverse. 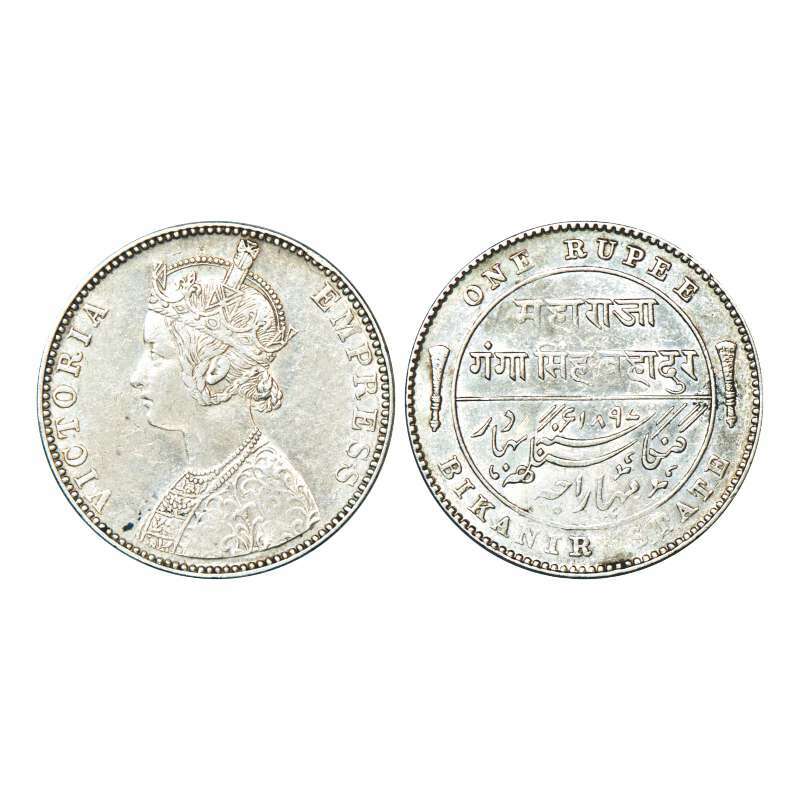 Baroda, Malhar Rao (1870-1875AD), silver nazarana rupee, Baroda mint, AH 1288 (1871-72). 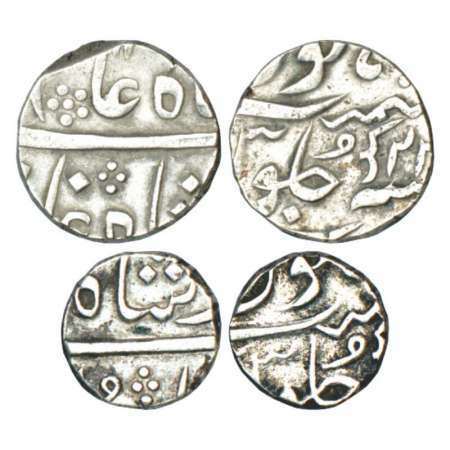 11.56g. Obv: Legend Sikka Mubarak Sena Khas Khel Samsher Bahadur visible in parts. 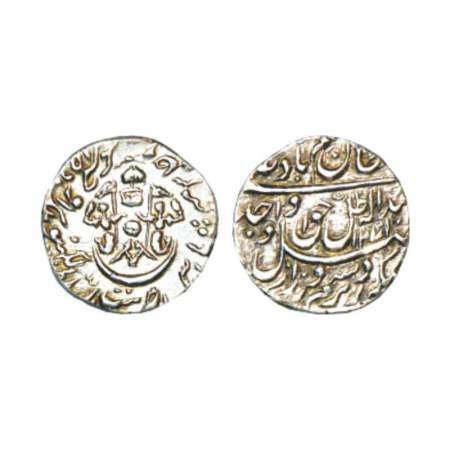 Rev: Date, mintname, sword symbol and Nagari initials Ma Ga.26.61mm. 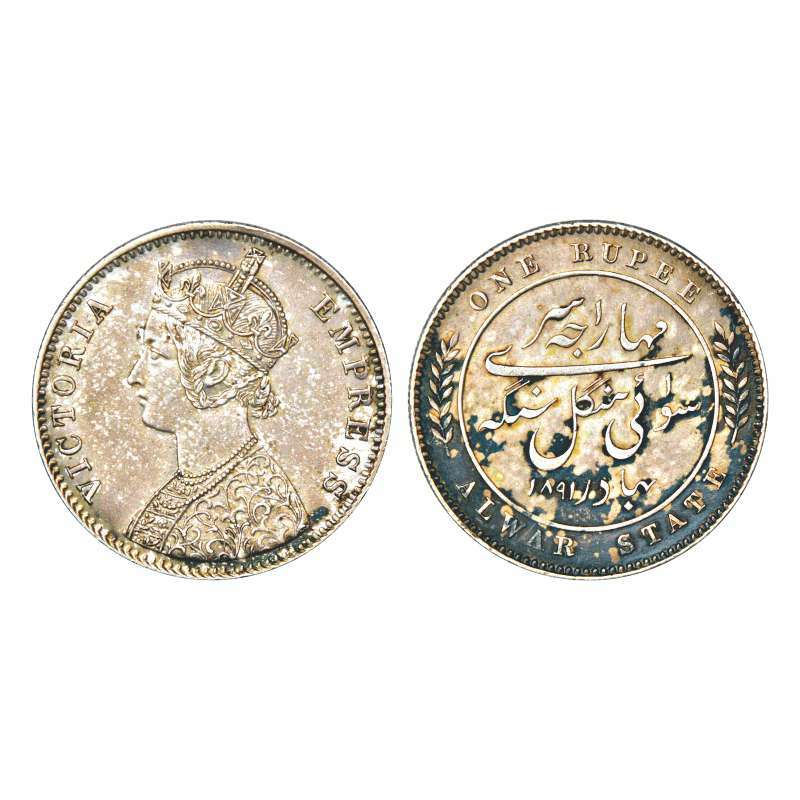 Lovely toning, Uncirculated, Exceptionally rare. 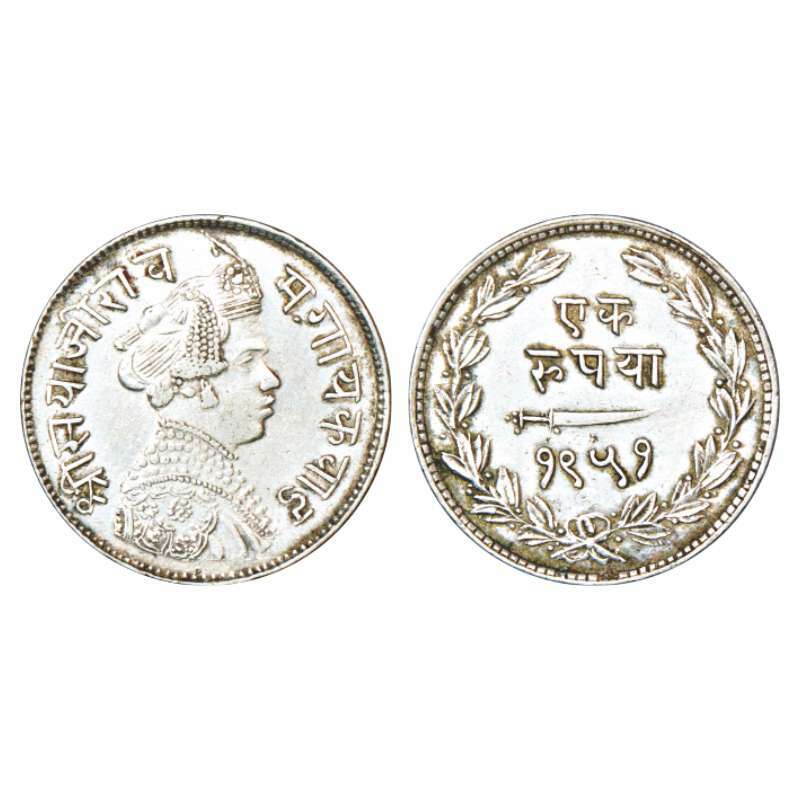 Malhar Rao Gaekwad was installed as Regent at the Durbarkhana, Baroda, 28th November 1870, on the death of his elder half-brother Maharaja Khande Rao II. He duly ascended the gadi on 5th July 1871. He was recognized by the Govt. 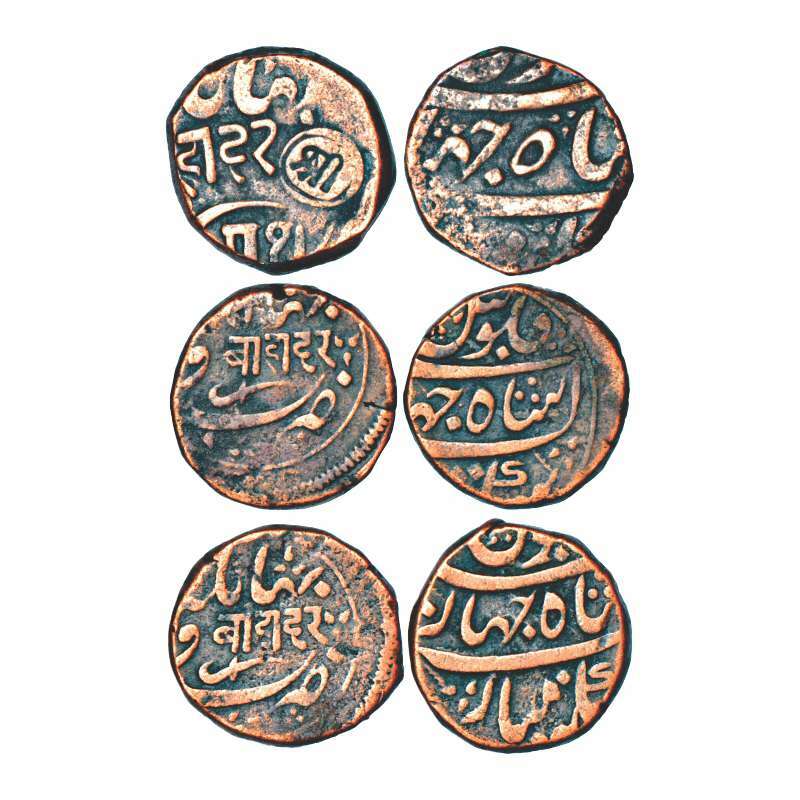 of India and formally installed as a king at Nazar Bagh, Baroda on 10th August 1871. 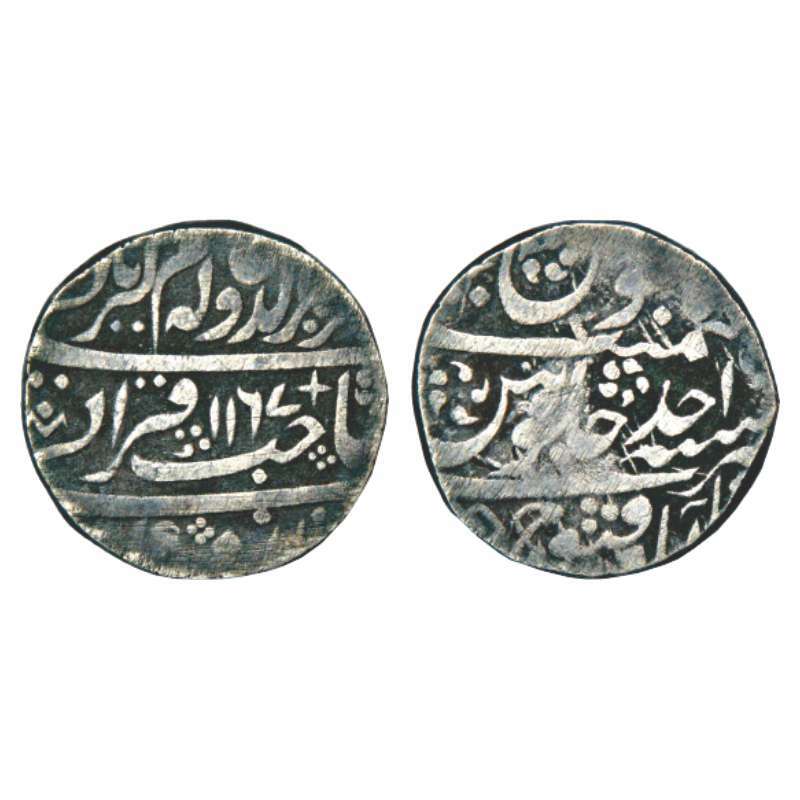 As the date on this Nazarana rupee corresponds to 1871-72, it is beyond doubt that it must have been struck as a special issue on either of these events. 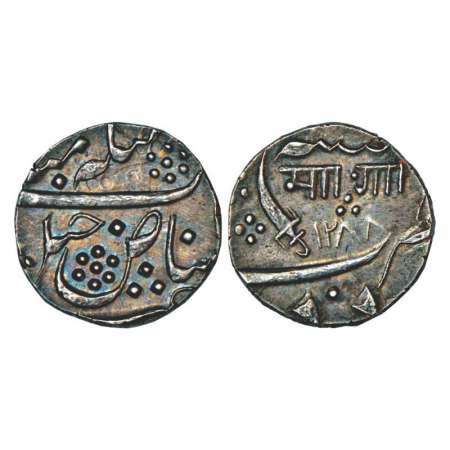 Baroda, Sayaji Rao III (1875-1938 AD), silver rupee, VS 1949. 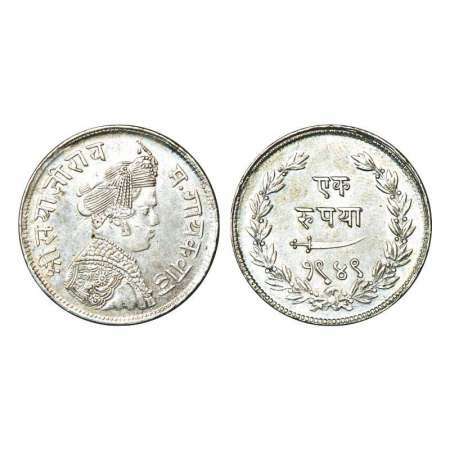 Obv: Portrait bust of Sayaji Rao III. 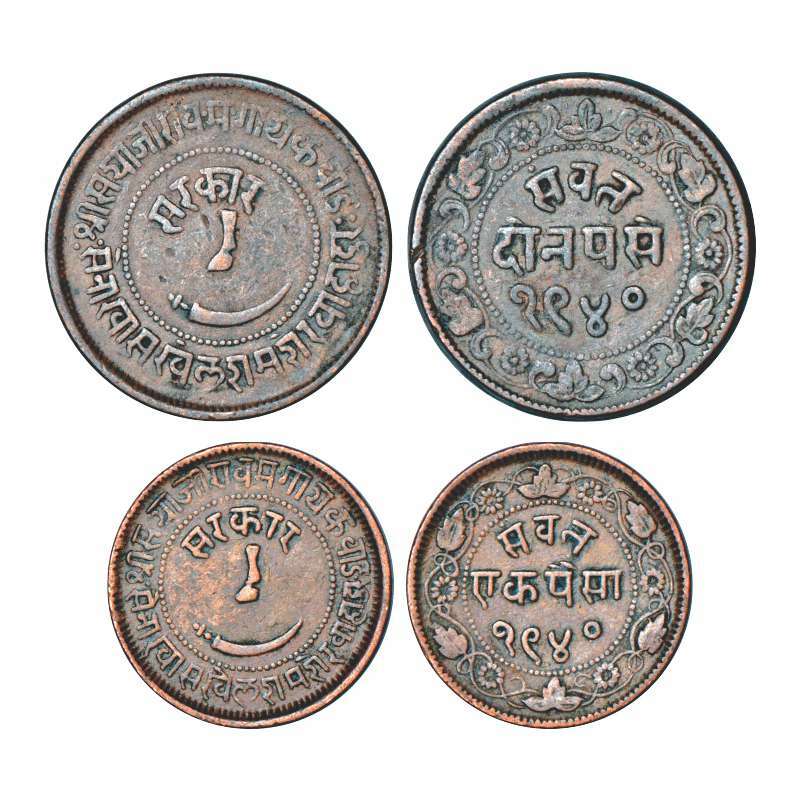 Rev: Denomination and date, KM Y36. 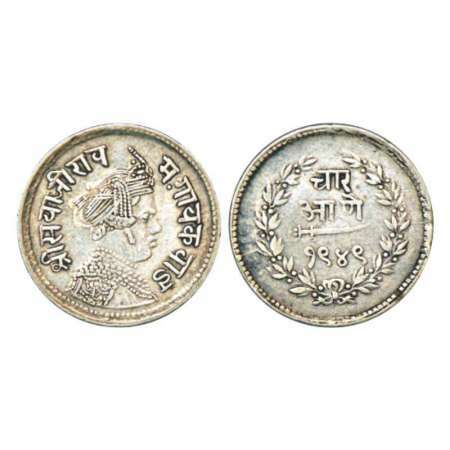 Baroda, Sayaji Rao III (1875-1938 AD), silver rupee, VS 1951. Obv: Portrait bust of Sayaji Rao III. 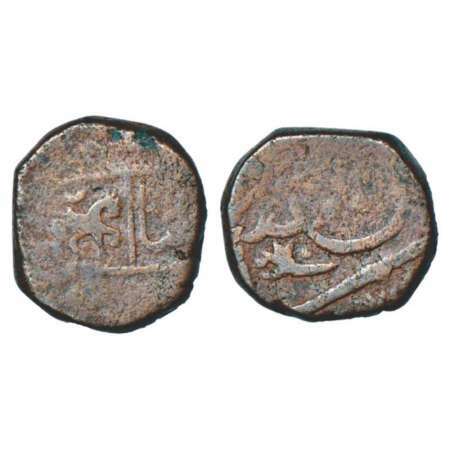 Rev: Denomination and date, KM Y36a. Baroda, Sayaji Rao III (1875-1938 AD), silver 4 annas, VS 1949. 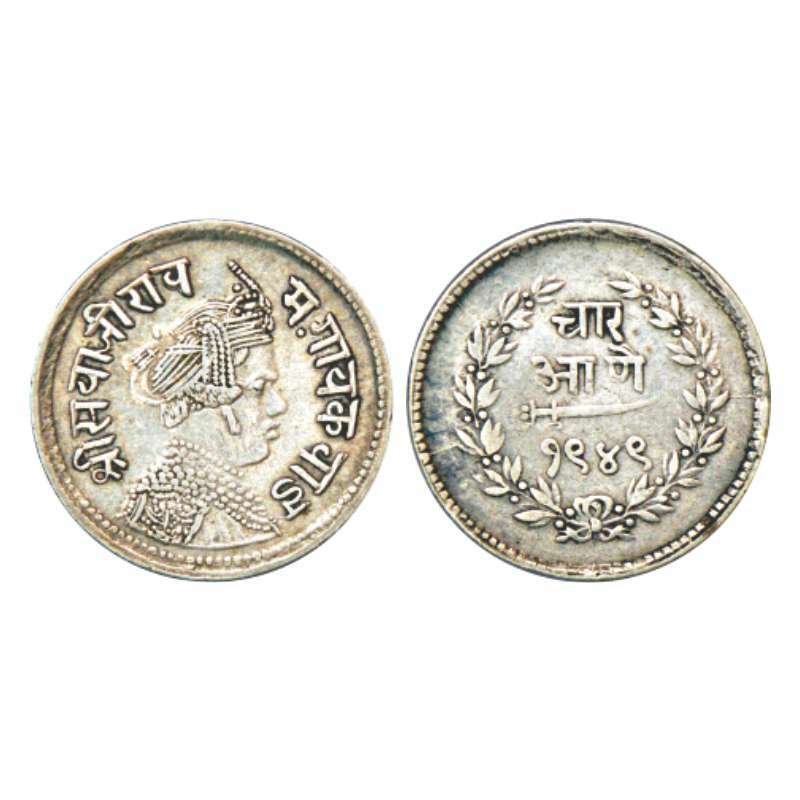 Obv: Portrait bust of Sayaji Rao III. 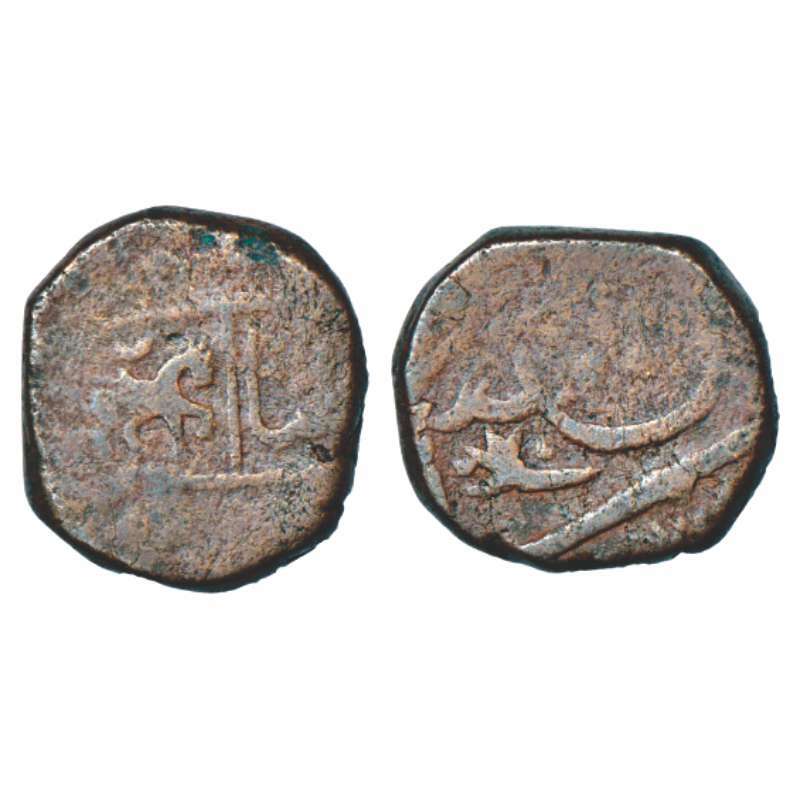 Rev: Denomination and date, KM Y34. 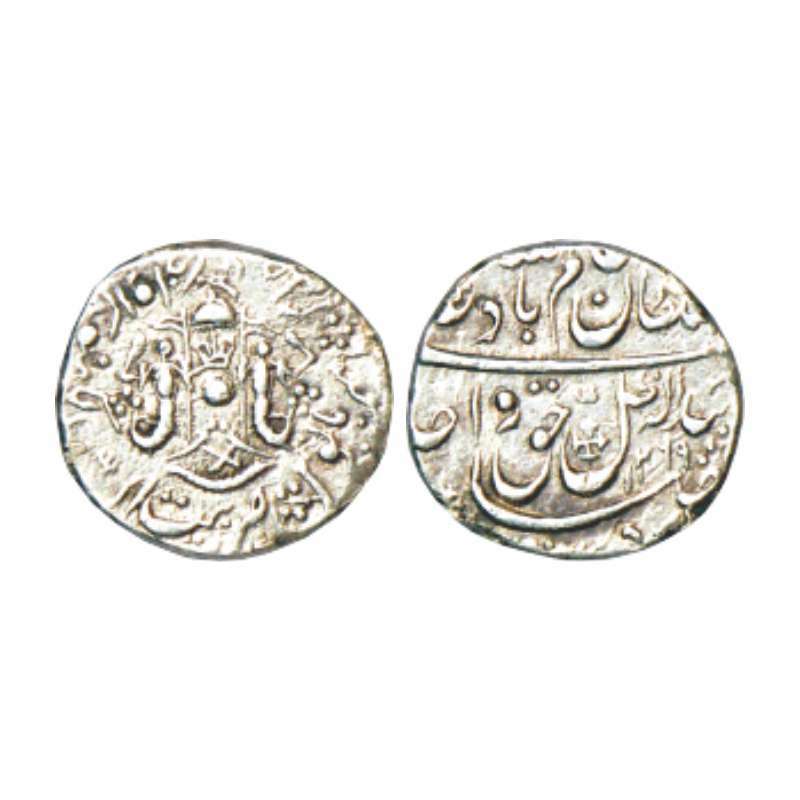 Bharatpur, Surajmal (1756-1763 AD), silver rupee, Mahaindrapur mint, in the name of Shah Alam II, RY 3, KM 36. Bikanir, Ganga Singh (1887-1942 AD), silver rupee, 1897. 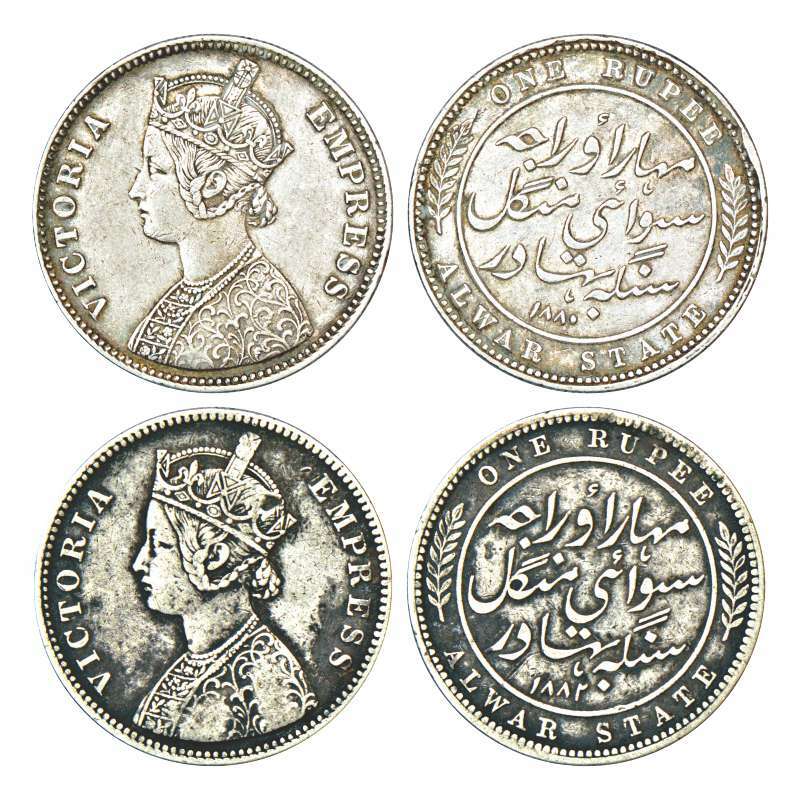 Obv: Portrait bust of Victoria Empress. Rev: Legend Maharaja Ganga Singh Bahadur, KM 72. Bundelkhand, Central India, copper kachcha paisa, 14.78g. 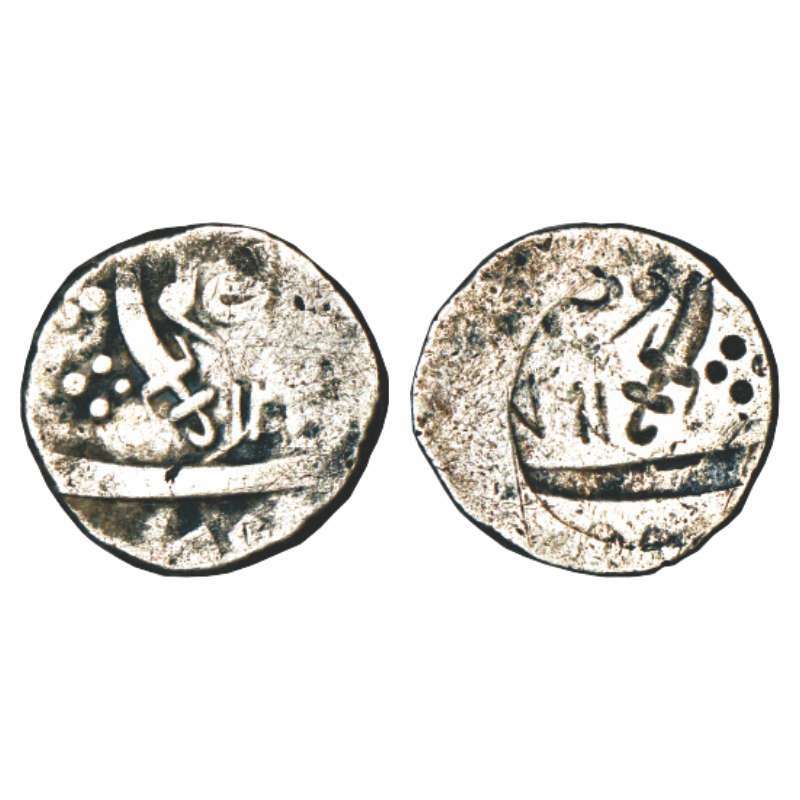 Obv: Horse facing right, above crescent. 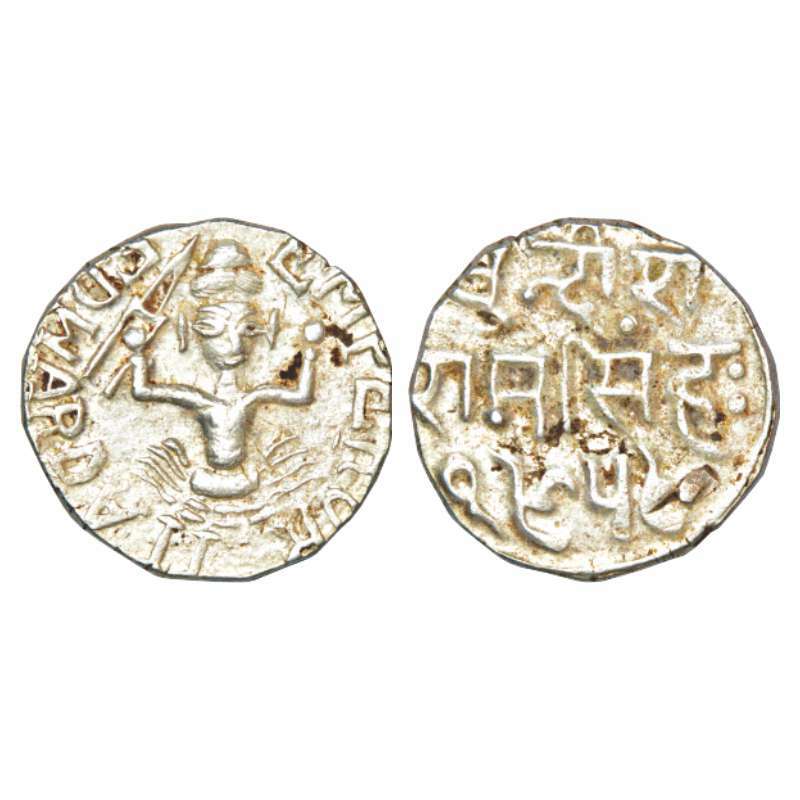 Rev: Unidentified legend. 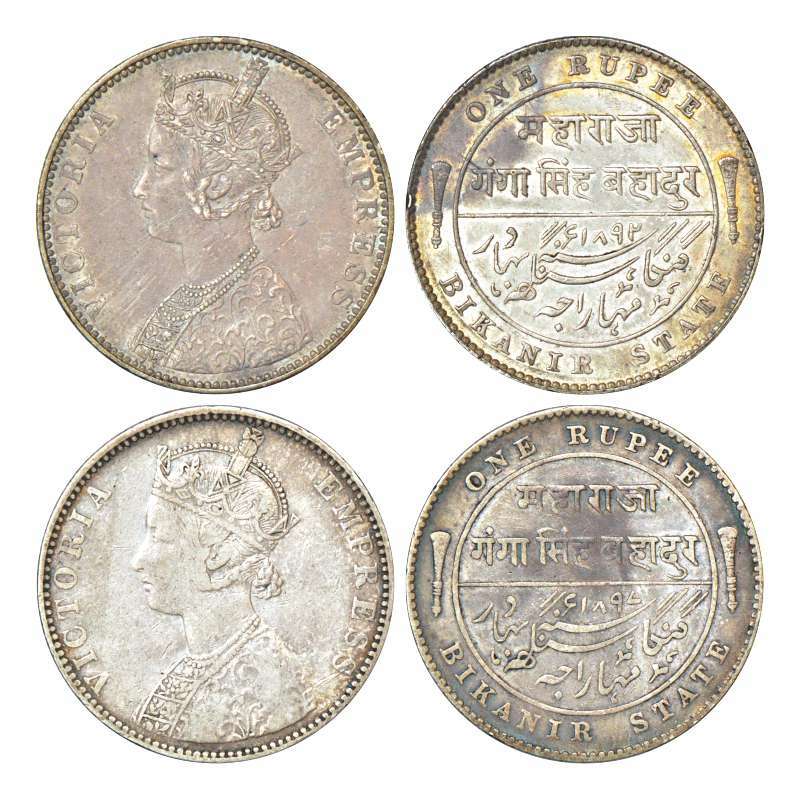 Bundi, Ram Singh (1824-1889 AD), error silver rupee, in the name of Edward VII, VS 1959, inverted 'A' instead of Roman numeral 'V' in Edward VII, KM Y11. Very fine and better, Very scarce. 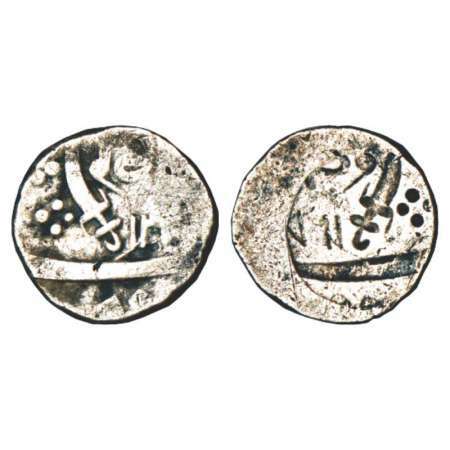 Hyderabad Feudatories, Narayanpeth, silver ½ rupee, 5.50g, Dilshadabad mint, in the name of Shah Alam II, AH 1252, Nagari 'Go' on obverse and Nagari 'La' on reverse, KM C39.